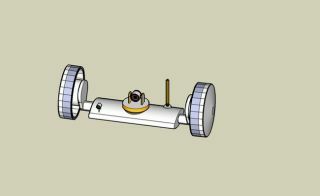 Team Frednet's design for a two-wheeled moon rover Jaluro. JALURO isan open-source two-wheeled lunar exploration robot. The robot is the entry ofTeam FREDNET in the Google Lunar X Prize competition. JALURO, which stands for"Just Another LUnar RObot", carries its payload underslung betweentwo wheels. Beingunderslung, it is in stable static equilibrium. Having independently controlledmotors for each wheel, it is fairly simple todrive forward, backward, and to make turns in any direction with any radiusfrom zero to infinity. It really is a neat concept! The good news is that thisproblem is apparently surmountable, with an equation of motion that is"fairly straightforward." "Going for the moon.Open-source. Interested? My dream was about getting into space; exploring,discovering, learning and teaching. To do that, space needed to become moreaccessible. What better way to advance accessibility than through open-sourceand open participation?" Learn more about Team FREDNET; watch a JALUROdemonstration video. See also Ask Charliecomments on 2-wheel robotic vehicles.